Virtuosos Unite. 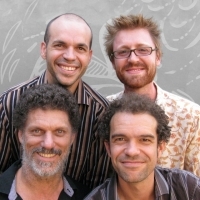 Fiery Urban Gypsies guitar duo Glenn Rogers and Alex Borthwick have joined forces with the dynamic Taal Naan percussion duo Steve Richter and Josh Hogan. Together they create a mix of music spinning raga, konnokol, latin, pop, jazz electronic, original compositions and surprising song interpretations. The videos below are form our first concert together. Urban Taal from glenn rogers on Vimeo. Wandering Spirit from glenn rogers on Vimeo. Equinox from glenn rogers on Vimeo. konokol from glenn rogers on Vimeo. Kalimba duo from glenn rogers on Vimeo.